Put yourself on the path to optimum health. Our natural health care services are customized to address the needs and concerns of each individual. 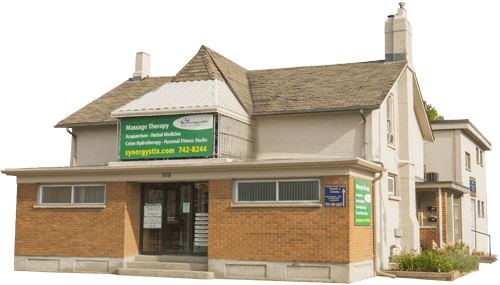 Synergystix, Partners in Health, provides massage therapies, colon hydrotherapy and one-on-one fitness training in a relaxed comfortable setting. 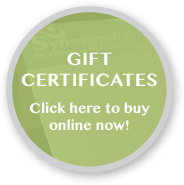 Synergystix has over 25 years experience. Registered Massage Therapists and Certified Fitness Trainers will consult with you to implement a therapeutic program designed to optimize your health and/or fitness goals. Our therapists and trainers are professional, certified, approachable, and most important, committed to your health. All therapeutic treatments are conducted in the privacy of a separate room. Our gym is well equipped. The emphasis is on post-rehabilitation, overall good health, and the feeling of well-being that achieving your personal fitness level will give you. If you are uncomfortable attending traditional fitness gyms, our gym is for you. 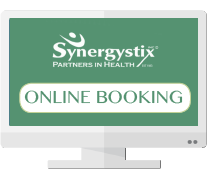 We invite you to visit us at the clinic to experience the Synergystix commitment to your health first hand. We are a multi-faceted professional team committed to providing an outstanding level of natural health care while continuing to educate and promote a healthy lifestyle within our clinic and our community. The Heart Wise Exercise programs are intended for participants who are interested or concerned about their health. Encourages regular, daily aerobic exercise. Encourages and incorporates warm up, cool down and self-monitoring with all exercise sessions. Allows participants to exercise at a safe level and offers options to modify intensity. Includes participants with chronic health conditions – physician approval may be required. Offers health screening for all participants. Has a documented emergency plan that is known to all exercise leaders, including the requirement of current CPR certification, phone access to local paramedic services and presence of an AED. These criteria could cover a variety of different levels and type of programs. Please read the program description provided to find the Heart Wise Exercise program most suitable for you. If you are unsure, please contact the program operator.